Software makes the difference in many systems and this software is exponentially growing in complexity and criticality. 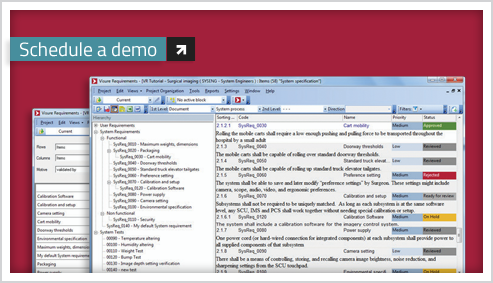 Demonstrate compliance to standards such as ISO 26262. This is usually a time consuming task and many times involves manual activities which are error prone. Deal with complex product lines to target different market segments. Keep track of approvals and reviews of the specifications. Establish an effective validation and verification procedure and generate full traceability reports. Deal with several tier relationships, exchanging requirement specifications with customers and suppliers. Market pressure and big competence often requires to drastically reduce time to market. Streamline the requirements process in order to achieve compliance with standards such as ISO 26262 and other regulations in a cost effective way. Generate in one click reports and dashboards of the traceability, requirements coverage, test status, risk analysis and audit. Implement a requirements interchange process to enable offline communication with customers and suppliers through XML based requirements interchange standards. Keep control of the approval and review process through workflow capabilities and baseline signature. Implement a test management process directly in Visure Requirements, or through the integration with third party products. Support large-scale projects through the use of relational database management systems (RDBMS) such as Oracle and SQL Server to keep information centralized. Save time and guarantee consistency by performing complete change impact analysis through end-to-end traceability and suspect links. Deal with the complexity of product lines and variants through component reuse. Automatically flag low quality requirements with ambiguity or inconsistencies, through semantic analysis.